On the third week of Vegan MoFo and we’re still going relatively strong. This week we will be traveling to the Mediterranean, to take a peak into cuisine and food issues centered around one of my favorite regions of the world. And one cannot venture into this culinarily wealthy realm without talking olives. Sadly, these puppies are by no stretch of the imagination local to the mid-Atlantic. However, it is the harvest season in regions in which olives grow well, so let’s celebrate this amazing produce item! This small tree species is native to eastern Mediterranean coastal areas. While it may be pretty, we are most interested in the fruits. The olive has figured prominently in classic literature and historic records that document the fruit’s importance to diet and culture of the region’s inhabitants. It holds significance for both war and peace, polytheistic and monotheistic religions, ancient athletic competitions and modern body care. The commercial production predates the Greeks, making an important contribution to Minoan civilization on Crete. In fact, the oldest olive tree has been radiocarbon dated to 2000 years old! At present, olive trees spans the globe in location of Mediterranean climates, such as California and parts of Australia. Six subspecies and thousands of “cultivars” or varieties make up the group we call olives. In that respect, your local gourmet market’s olive bar is a sorry representation of the true diversity of this fruit. Even with all this variation and globe-trotting, over 2/3 of olive production takes place in Spain, Italy, and Greece (and Spain is more than half of that). 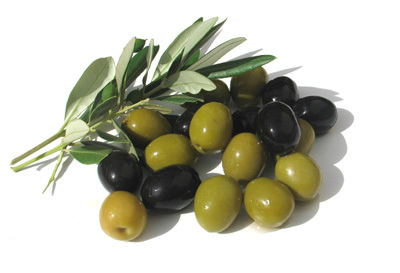 Deriving its Latin name, Oliva, from its Greek origins, the olive also inspired the words for “oil” in many languages. Olive oil is one of the pantry staples that no good Italian (or half) can do without. While I don’t actually like olives in their whole form, I use the oil for almost all my cooking (and some of my baking). That said, it’s difficult to find recipes where the oil itself is the star of the dish. Hummus is one of those side dish/appetizers that makes or breaks an evening at a Mediterranean restaurant. It is also ridiculously easy to make at home! There are all sorts of variations, but I like the classic. You can also easily reach the desired consistency with water and lemon juice instead of lots of oil, however, the best hummus experiences I’ve had resulted largely from the fragrant olive flavor that builds depth in a good hummus. 1 cup dried garbanzo beans, soaked and cooked until very soft. 101 Cookbooks once again delivers with olive oil crackers and kale and olive oil mashed potatoes! Roasted kabocha squash with olive oil sounds fantastic and sauteed kale with garlic and olive oil is perfect for this time of year. And if you are looking for some dessert, try the toasts with chocolate, olive oil, and sea salt or lemon rosemary olive oil cake.